needless to say some of my friends totally disagreed and had something to say. I was even came at sideways over my opinion but hey, that’s the price of the Unpopular Opinion. It is what it is. I am not above trying to prove my point so let’s break this down. A few things that we need to remember. SO! I was told it was unfair to “compare careers” so it’s a good thing I’m not and never planned to. This is solely about rapping. You know Lyrics, Bars, Similes, Metaphors, Analogies and Concepts and shoot for the heck of it let’s throw in Story Telling. I simply just don’t think Kendrick is a better rapper than Drake although Kendrick is dope. I’ll give him his respect. If we get on a track together I’m having the best verse. My songs are better than yours. I think I am the best rapper out today. I have NO PROBLEM with K.Dot feeling this way. He should feel that way. If you don’t rap to be the best, stop rapping! Period! The REAL QUESTION is outside of those names, what else do you remember about the verse? His energy and tenacity on the track don’t count in a world of lyrics. Some of you don’t want to believe the King of NY line is from Kurupt…sorry you live in denial. I will go on record and say at listen number 3 I felt both Him and Big Sean had the top two verses of the year…now…not so much. I think Kendrick’s “Nosetalgia” verse Trumps his control verse easily! You know what verse set things on fire in 2013? 5AM In Toronto. Drake’s Versace verse. Drake’s Verses on All Me and there are actually things you can remember that sound hot on them. Let me tell you what you remember from Kendrick over the last 12 months. Now there are some K. Dot SUPER STANS that will tell me “What about Cartoons and Cereal and ADHD”..My Answer: Don’t tell that to me, tell that to people who don’t know the music exist yet still saying Kendrick the best. Cause they have no idea. Yes! Kendrick’s Album has played well over into 2013. That’s cause his album is dope! However history has proven time and time over that the best rapper doesn’t always make the best album. I personally felt Nas”Life is Good” album topped 2012 as far as hip-hop. I think we are at a point now where too many people want to hate Drake and too many people feel they have to love Kendrick Lamar. I don’t remember a time when a guys charisma and energy has won over so well. Busta Rhymes would probably be the G.O.A.T if he was dropping his best albums during this time. It seems that hip-hop fans are so starved for someone new to takeover but I’ll be honest, I don’t think Drake is going to slow down anytime soon. He’s not my “Favorite” but Drake undoubtedly runs the game right now. Yes he makes hits and songs for the ladies and I do think he has the ULTIMATE SUCKA N***A Anthem with Marvin’s Room but, if you think Drake doesn’t have BARS you tripping! I’ll give Kendrick Story Telling though. I think he could become the greatest story tellers ever if his product stays consistent. I also feel that the stories he tells and the pictures he paints are so great that people just want to give him the crown…he need the memorable lines and the quotable verses though. Drake has too many of those to deny him right now . Now some of Drake’s story have you like “Man WTF he just say!? !” but in a bad I feel like a sucker listening type of way. Nothing I can do about that but acknowledge it, accept it and say..but what about his No Lie Verse though? 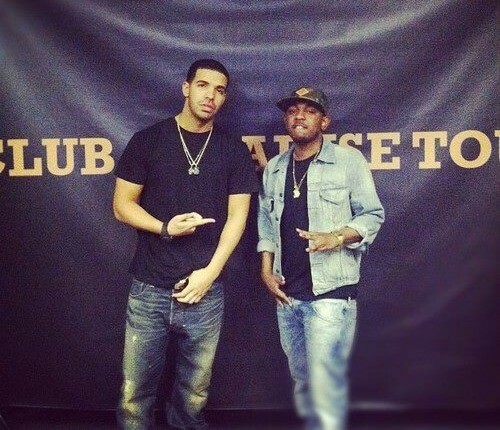 Summary: Drake handily over Kendrick Lamar Bar for Bar ANY DAY! I feel Drake is just a more clever and relatable emcee. Two main qualities I feel every GREAT in the game should have. Kendrick really has impact and energy but we all got to keep it 1,004 and admit that Kendrick’s verses don’t resonate even after 3 listens. We all just say “MAN! KENDRICK JAPPED ON THAT VERSE” but when asked “What he say on it?” We all sit and ponder. Prediction: By 2015 this won’t be a valid argument. We will have a clear answer to this question whether I am right or wrong. I totally agree wit this Kendrick is a great rapper. But over Drake’s body of work I’ve hear rap verses and songs just as clever with amazing delivery as any and all of Kendricks best verses and tracks. Its like they try to downplay Drake because he happens to sing too. I guess if you can sing, you obviously can’t be a beast at rap too? I just don’t understand a lot of hiphop fans.